A few weeks ago, I posted pictures of the pieces that I made with the fabulous package of beads that I received from Chris Murphy as a part of Lori Anderson's Bead Soup Party. 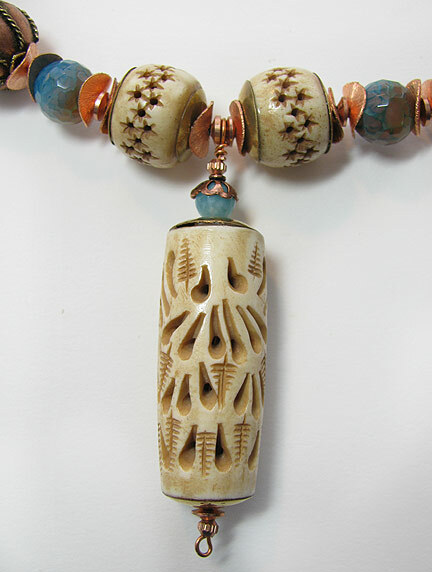 Today, I want to show you how fast and easy it is to make a piece like the one shown above when you've got a nice selection of large beads, and great pendant, and some waxed cotton cord. 1. 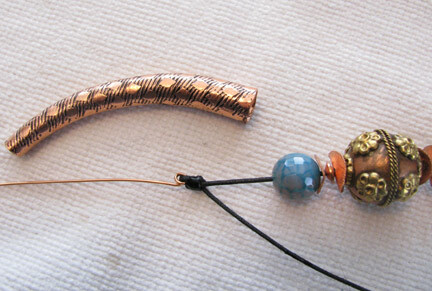 Cut a piece of wire that is long enough to create a wrapped loop and to hide the end in the copper cone. 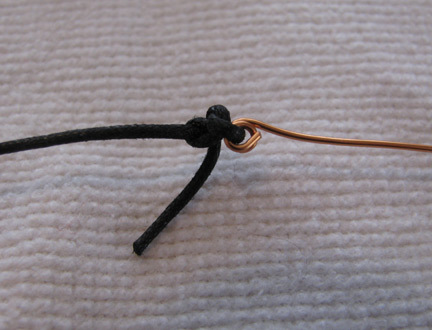 Turn a double loop on the end of the wire with your round nose pliers. Tie the end of a length of cord to the loop and glue the knot. 2. Feed the wire up through the cone and thread on a small fire agate and a bead cap. 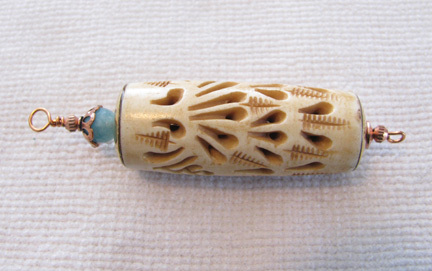 Turn a wrapped loop around one half of the clasp. 3. Cut a piece of wire and turn a small simple loop at the bottom. 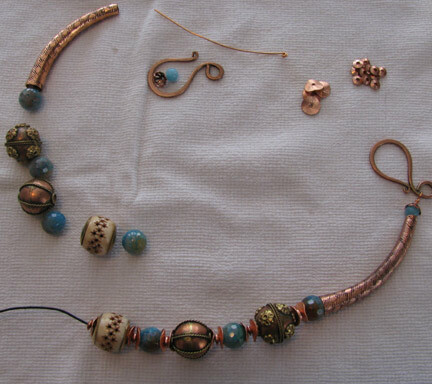 Thread on some small copper beads, the central pendant, a small fire agate, and a bead cap. Make a wrapped loop at the top and set the piece aside. 4. String on assorted beads in a pleasing pattern until you reach a length that is half of your desired finished length. String on the pendant and continue up the second half of the necklace. 5. 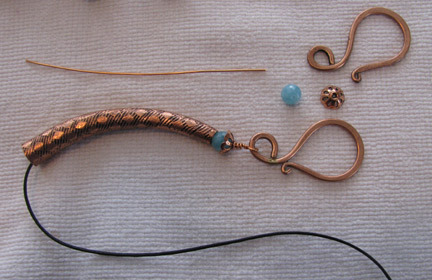 Prepare another piece of wire to finish the end of the necklace. Tie the cord and glue the knot. Trim the cord end and slip the wire up through the second cone. 6. 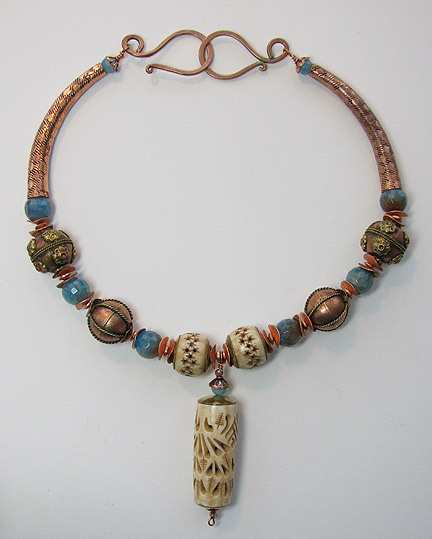 Add a small fire agate and a bead cap, and turn another wrapped loop around the other half of the clasp. That is so pretty. Thanks for posting a how-to. Wow, I love how this turned out. Excellent tutorial with some great tips. Thanks, Cyndi. 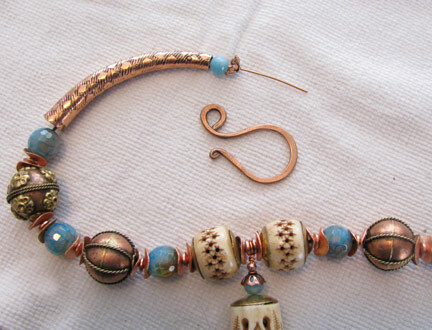 Terrific tutorial and what a beautiful necklace! Such a pretty piece! Thanks for sharing how you did it... most inspiring! wow- gorgeous! Thank you for the tutorial also! Beautiful necklace and a fabulous tutorial. As one who is just embarking on my first jewellry projects, it's nice to see something so stunning broken down into managebale steps.